In Uncertainty, Ariel finds out more information about her grandmother's visions and family secrets. An unexpected reunion turns her life upside down, and she doesn't know who to trust. In Luminosity, Ariel is haunted by reoccuring nightmares that bring her back to the spooky Dexter orphanage in search of something she once lost..but she's not the only one looking for it. 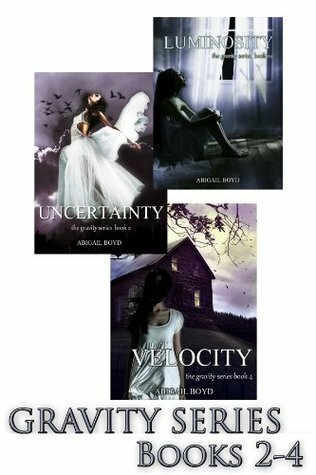 In the final volume of the series, Velocity, Ariel finds out the truth behind why she's seeing ghosts, and the depth of what her powers are. She must stand up against the heinous Thornhill Society in their nefarious plot to bring Hell on earth. I am not going to go into a big, long and drawn-out review of all of the reasons that you should read this series. Good Golly Miss Molly, just go read it! There are ghosts, and demons, and Limbo and Dark and creepy crows and even creepier people. Ghost Grandma, Lady in the Red Dress with the Red, Red Eyes. There are truly great friends, and once in a lifetime loves. There are murders, seances, cults and chanting and magical rocks, and pretty ugly magical necklaces. There is a IMPENETRABLE black fog over a town, and crazed folk running around in cloaks with light shooting out of their fingers. MEAN girls that give mean girls their name. There is so much goodness in this series, I don't even know where to begin. Don't let the fact that this is a self-published story scare you away. Yes, there are some editing issues, but the story is so good, the characters are so well written and believable and the world-building is so spot on, that you can look past it and have a great time. Ariel, Henry, Theo, Alex, Ariel's dad and Theo's mom. Just give it a shot! Be warned, for people who don't like horror, go into this one lightly. It isn't too scary but there are definitely some spooky and creepy scenes. Otherwise, jump on in and have a great time! ~5 Stars, Without a Doubt!